From one imperial capital to another. 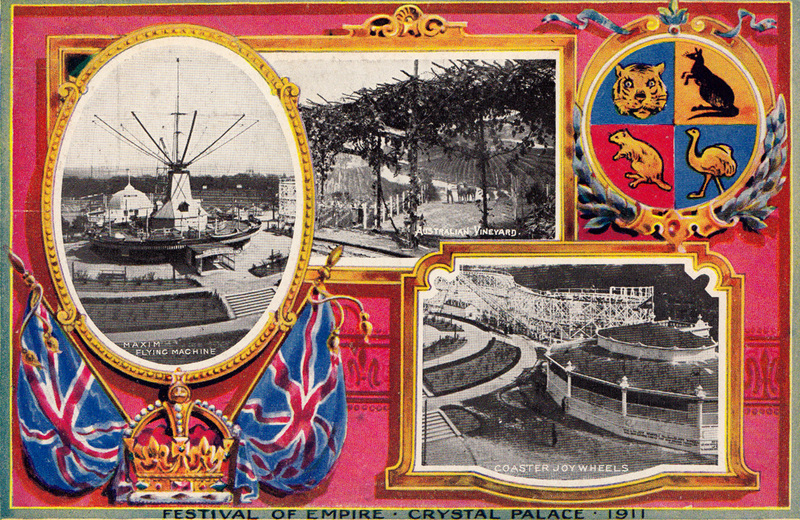 I found this postcard, which commemorates the Festive of Empire that was staged at the Crystal Palace in London in 1911, in a shop in the Galerie Vivienne in Paris, one fine spring morning in 2014. Designed by Joseph Paxton and built almost exclusively from iron and glass, the Crystal Palace was one of the architectural wonders of the modern world. Originally intended to house the Great Exhibition that was staged in London’s Hyde Park in 1851, the Palace was subsequently dismantled, remodelled and rebuilt in the south London suburb of Norwood, where it reopened to the public in 1854. 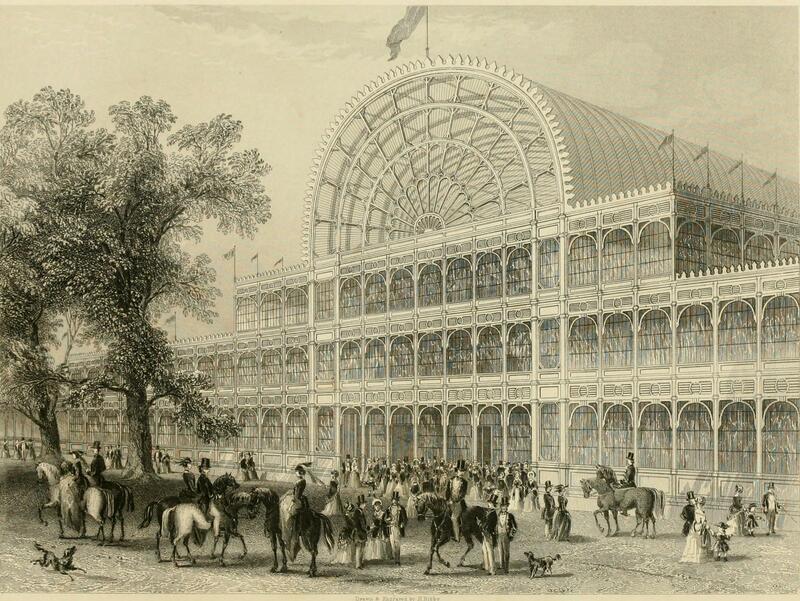 The Crystal Palace, from Tallis’s history and description of the Crystal palace, and the Exhibition of the world’s industry in 1851. Source: Wikipedia. At Holborn Viaduct there was a perpetual rush of people for trains to the ‘Paliss.’ As soon as a train was full, off it went, and another long string of empty carriages drew up in its place. At the end of the nineteenth century the Palace, now nearly fifty years old, was ageing, decaying, and struggling financially. On more than one occasion it had to be bailed out of its financial difficulties. The hosting of the Festival of Empire in 1911 was one response to the Palace’s woes. On this Festival of Empire postcard, two photographs show amusement rides at the festival: the Maxim Flying Machine, looking curiously like (and about as safe as) an exploded windmill, and a rollercoaster called the Coaster Joywheels. The third photograph is of the festival’s reconstruction of an Australian vineyard. The Festival of Empire was a celebration of Britain’s imperialism at its zenith, the ultimate imperialist propaganda showcase, a ‘Social Gathering of the British Family’,2 with the four jewels in Britain’s crown – India, South Africa, Canada, Australia – at its heart, and represented on the postcard by the tiger, ostrich, beaver and kangaroo respectively. 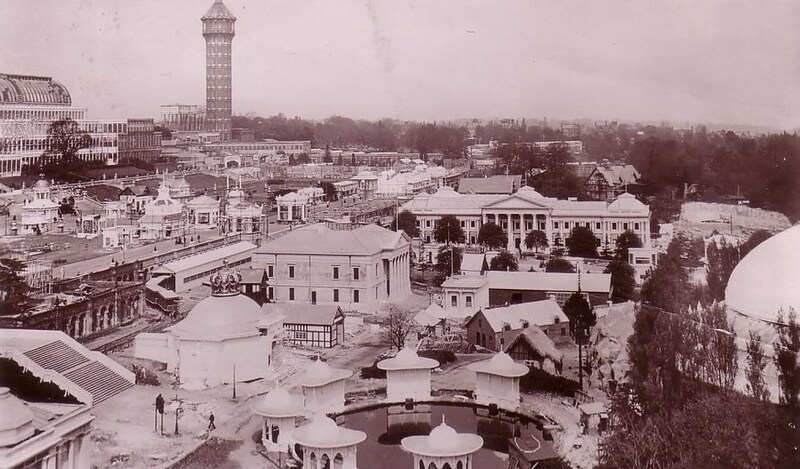 In the grounds of the Crystal Palace, Britain’s colonial possessions were reproduced in miniature, in the form of two-thirds replicas of the government buildings of South Africa, Newfoundland, New Zealand, Australia and Canada. 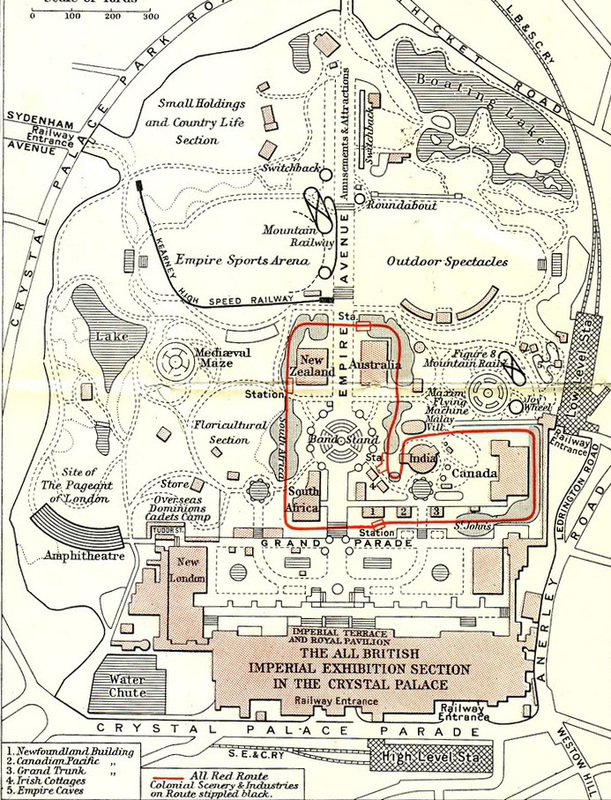 Detail of a map of the 1911 Festival of Empire grounds, including the All Red Route. And yet, while the All Red Route was circular in layout, and was guaranteed to bring you back to your starting point, just as sure as the sun was never likely to set on the Empire, return trips were not what the organisers of the Festival of Empire had in mind. As well as exhibitions showcasing their products and industries, the colonial government buildings also functioned as recruiting centres for potential settlers from Britain. View from the Canadian replica Parliament Building of the Festival at the Crystal Palace. Source: Wikipedia. One of the reasons the Festival of Empire could openly and actively encourage emigration from Britain to the Empire’s colonies and dominions was because, by the early twentieth century, a raft of administrative and legal frameworks existed to facilitate emigration on an industrial scale, usually to the cost of indigenous populations. Elsewhere, the European population of New Zealand (thanks in part a result of the gold rush of the mid-nineteenth century) grew from 2,000 in 1840 to just short of a million by 1908.7 One legal mechanism making possible the acquisition of native land for pasture and settlement was the Native Land Court of New Zealand. The Court, established in 1865, facilitated the transfer of Maori land to European settlers, and aimed for the ‘extinction’ of the Maori proprietary customs relating to land. George Gissing, The Netherworld (Oxford: Oxford University Press, 2008), 105, 110. Deborah S Ryan “Staging the Imperial City: the Pageant of London, 1911” in Imperial Cities: Landscape, Display and Identity, ed. Felix Driver and David Gilbert (Manchester: Manchester University Press, 2003), 117-135. Stefan Zweig, The World of Yesterday (lincoln: University of Nebraska Press, 1964,89. Stephen Constantine, “7: Migrants and Settlers,” in The Oxford History of the British Empire, ed. Alaine Low, Judith M. Brown, and Wm. Roger Louis, vol. 4 (Oxford: Oxford University Press, 1999), 166. “Canada” in Encyclopedia Britannica (Cambridge: Cambridge University Press, 1911), 148–149. Quotes taken from the 1890 illustration Salvation Army Social Campaign, available on Wikipedia. William Booth, In Darkest England and the Way Out (Cambridge: Cambridge University Press, 2014), 93.